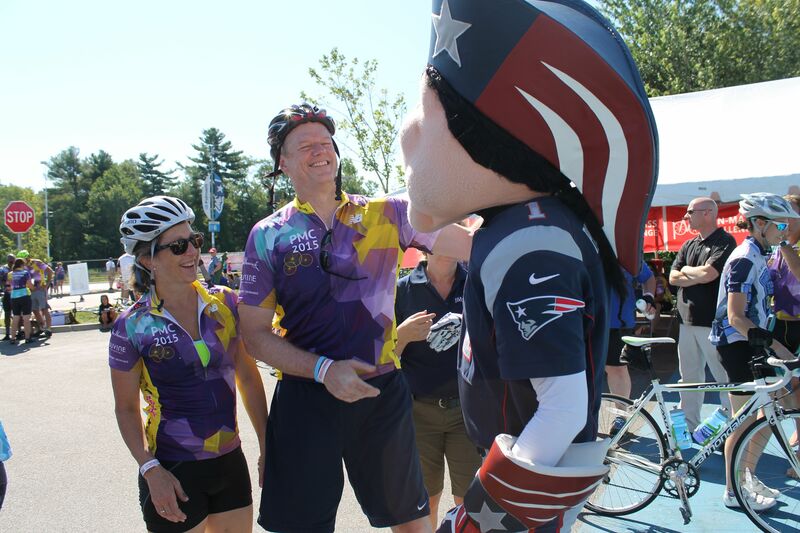 Massachusetts Governor Charlie Baker is greeted by Patriots mascot Pat Patriot after crossing the finish line of the 2015 Pan-Mass Challenge’s Wellesley Loop route at Patriot Place on Sunday, Aug. 2. Gov. Baker and Boston City Mayor Marty Walsh rode the 27-mile course to benefit cancer research. Governor Charlie Baker and Boston Mayor Marty Walsh join more than 6,000 cyclists in 2015 Pan-Mass Challenge to raise $45 million for cancer research. Massachusetts Governor Charlie Baker and Boston City Mayor Marty Walsh joined thousands of cyclists in the 2015 Pan-Mass Challenge on Sunday, Aug. 2, with the goal of raising awareness and funds to benefit cancer research. Baker and Walsh rode the 27-mile course from Babson College in Wellesley to Gillette Stadium at Patriot Place in Foxborough. Baker and Walsh interacted with cyclists and spectators, including Patriots mascot Pat Patriot, at the Patriot Place water stop. Cyclists participating in the two-day event aimed to raise $45 million for life-saving cancer research and treatment at Dana-Farber Cancer Institute – up from the $41 million raised in 2014. All riders are committed to raise between $500 and $5,000, with 100 percent of the funds going directly to patient care and cancer research at the Dana-Farber Cancer Institute through the Jimmy Fund. Since its inception in 1980, the PMC has contributed $455 million to cancer research and treatment at the Dana-Farber Cancer Institute and PMC Board of Trustees Chairman David Fialkow expects this year’s event to push that total over $500 million. Patriots mascot Pat Patriot greets Massachusetts Gov. Charlie Baker (second from left) and Boston City Mayor Marty Walsh (far right) at the finish line of the 2015 Pan-Mass Challenge’s Wellesley Loop route at Patriot Place on Sunday, Aug. 2. Contributing more than $5 million of that total since 2008 has been the Patriots Platelet Pedalers, who stopped at Patriot Place Sunday en route to the finish line in Wellesley as part of the event’s 192-mile route. 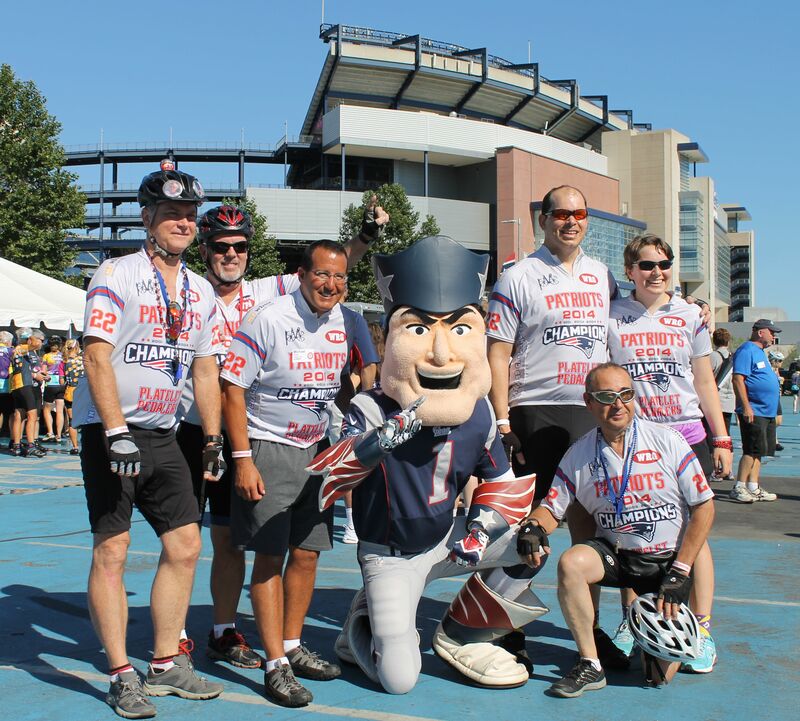 In 2014, the Patriots Platelet Pedalers consisted of 126 team members and raised more than $855,000 for the Dana-Farber Cancer Institute. The funds are earmarked for Dr. Ken Anderson, the Kraft Family Professor of Medicine at Harvard Medical School and Dana-Farber Cancer Institute, to support his multiple myeloma research and development of novel therapies. For more information, visit www.pmc.org.